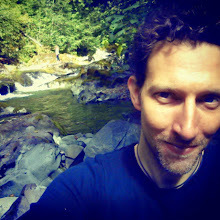 I started my first running workshop on Monday of this week, though technically this first class was a walking workshop. 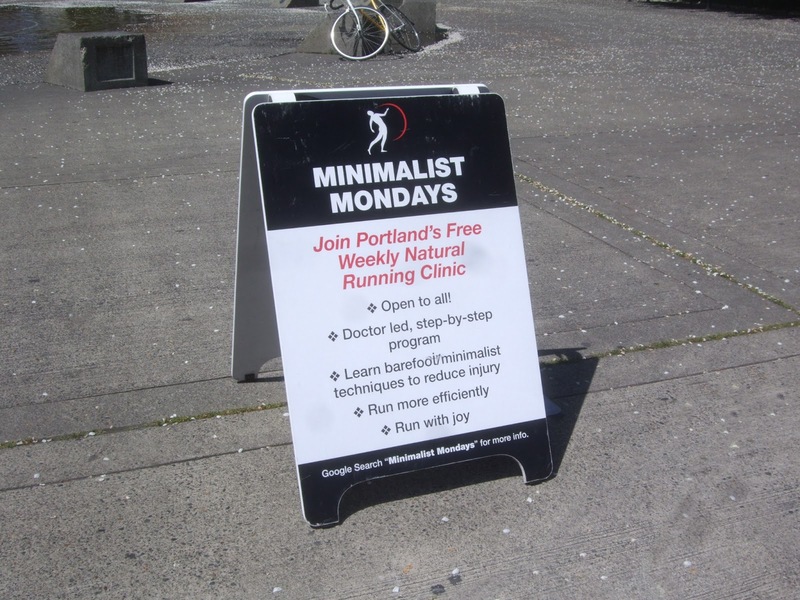 The workshop I'm taking is called Minimalist Mondays, and it's a free 12-week class taught in Portland by two experts in the field. Dr. Ray McClanahan is a podiatrist at Northwest Foot & Ankle and Dr. Sanatan Golden is a physical therapist at Therapeutic Associates. 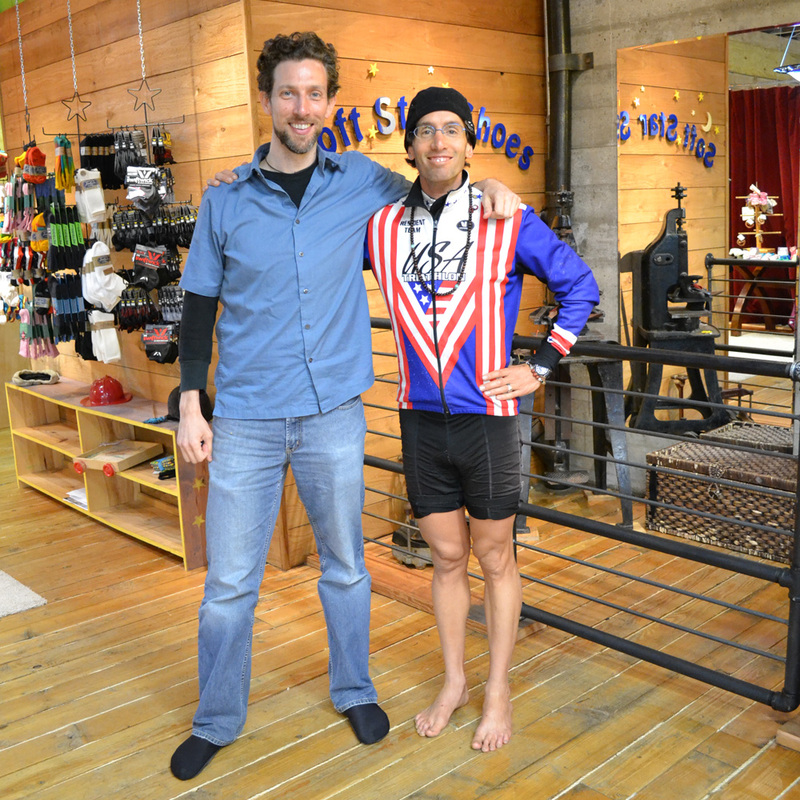 Both are strong advocates of curing foot problems by restoring natural foot function (i.e., going barefoot). They offer these weekly pro bono workshops simply because they want to encourage running and to teach people how to do it in a healthy way. No catch. I came into contact with the good doctors through my job at Soft Star. I helped a walk-in customer one day and after talking with her in-depth about the benefits of barefoot shoes she recommended I get in touch with a podiatrist in Portland who held similar beliefs. She couldn't remember his name, but wrote down the address of his website. That scrap of paper sat on my desk for weeks before I finally got around to typing it in, and when I did I was amazed. It turns out Dr. Ray had written several in-depth articles about the benefits of going barefoot. These articles ranged from the importance of ditching arch supports to the dangers of toe springs to pronation issues caused by tapered toe boxes. Much of what he wrote was news I had heard before from the barefoot community, with two exceptions: 1) These weren't rumors from a bunch of amateurs who were just making assumptions, but sound articles backed by scientific evidence from a trained medical professional, and 2) some of these articles were written over a decade ago, long before Born to Run was published. If that wasn't enough, this guy was located in Portland—only 90 miles away from my small town of Corvallis. Suffice it to say, I quickly became a fan of Dr. Ray. After contacting him and becoming buddies with his team, I was excited to learn they were already fans of Soft Star and had been recommending our shoes to their patients for some time. His friend Sanatan then joined the conversations and we've been trading information ever since. As fate would have it, I learned about the upcoming spring session of their free workshop in injury-free minimalist running conveniently as I was recovering from a minimalist running injury. People pay big money to take workshops like this from trained professionals, and all I had to do was adjust my work schedule and drive 90 minutes. Sometimes life just works out for you. So I started my first class on Monday, and they had a special guest to teach it. Michael Sandler is a barefoot guru who practices what he preaches. A few years ago, Michael suffered a freak cycling accident that gave him a shattered femur, titanium implants, ten knee operations and the dreadful prognosis that he would never run again. After discovering online that running without shoes may lead to less impact force, he decided to give it a try. 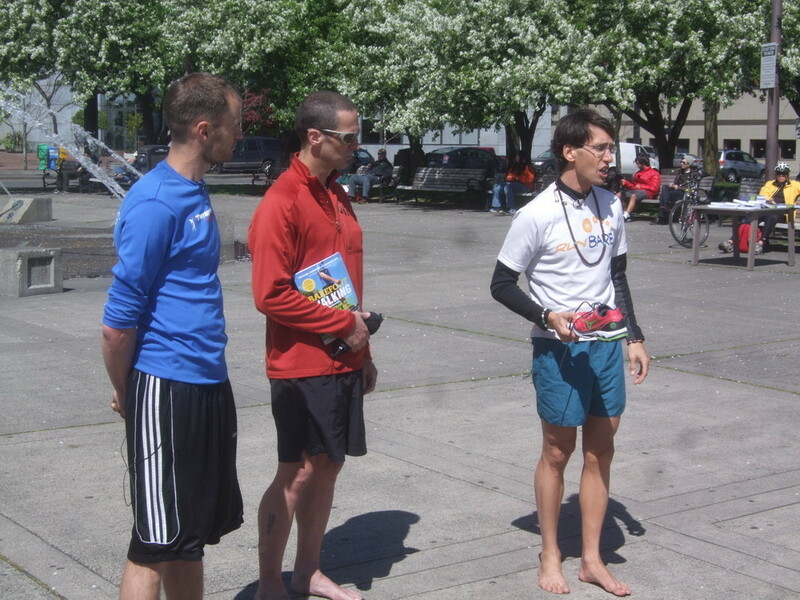 Three months later, he ran a 10k barefoot and finished with his fastest time ever. Since then, Sandler has devoted his life to teaching others to run barefoot and injury-free. 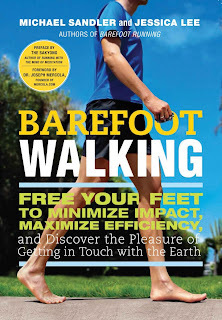 He and his wife, Jessica Lee, have published a best-selling book and a DVD about barefoot running, and just last week released their latest book, Barefoot Walking. 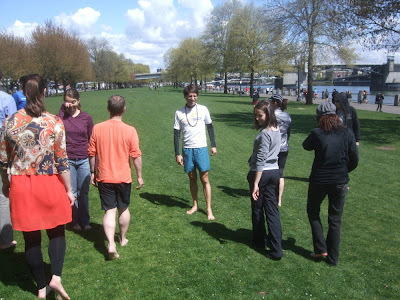 Since the first class of Minimalist Mondays was about walking barefoot, who better to teach it? I had actually met Michael a couple years ago when I first started working at Soft Star. He stopped by to visit our workshop, but the meeting was brief and I had no idea who he was at the time. Since then, I've read his book, watched his movie and have learned the value of his teachings. Now I finally found another chance to meet him in person, this time with a better appreciation of his expertise. We met at Portland's beautiful Waterfront Park with roughly a dozen students, and Michael began the session with his tragic story and miraculous recovery. Before going barefoot, he needed special orthotic shoes just to get out of bed. Now he's barefoot as much as possible and running like the wind. He's also a strong proponent of Earthing, also known as Grounding. This is the theory that energy from the Earth is a vital part of a healthy life, and separation from the earth through synthetic materials such as rubber or vinyl can lead to a multitude of health problems. Although Earthing can sound a little bizarre if you've never heard it before, I've met too many sound people who swear by it to write it off as nonsense. 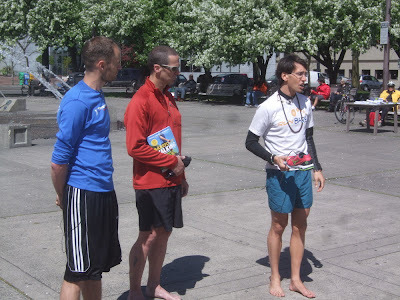 I thought barefoot running was nonsense the first time I heard about it, and now I think you're crazy if you don't do it. Michael then had us take off our shoes, plug our ears and stomp our feet, landing first on our heels and then on our our forefeet. The sound difference between the two was unmistakable: the heel was a pounding reverberation while the forefoot was almost silent. He compared a heel strike to a hammer, then compared this hammer to how we walk in conventional shoes. He quickly found a sample of a modern running shoe from a woman in the class and explained how the thick heel, toe spring, arch support and motion-control tread force feet into unnatural positions that lead to shin splints, plantar fasciitis and a whole bunch of other bad things. As a Soft Star Elf, I shone with pride when he held up a leather-soled Soft Star Dash RunAmoc as a sample of an idea shoe for those times when you can't go barefoot. Dr. Sanatan Golden (left), Dr. Ray McClanahan (center) and Michael Sandler (right), as Michael shows how this conventional foot coffin is more of a hammer than a shoe. The last part of our workshop involved walking exercises. Michael showed us three types of walking: a springy, stealthy walk on the balls of your feet (good for sneaking up on people), a walk in which your toes grab the ground with every step (good for building strong toes and arches) and a rolling walk that lightly touches the heel before transitioning to the forefoot (good for people who are accustomed to heel-striking). We had the convenience of a plot of grass and a brilliantly sunny sky as we practiced our walks, and I don't mind saying it felt great. This was turning out to be a perfect day. And then we found out about Boston. A woman in the class received word from her husband about the attacks and told the rest of the group. Many of us knew people who were running in the marathon, and the mood quickly changed. I already wrote about the rest of that story in my previous post, so I won't repeat it here. Michael took a moment of silence and finished the workshop. All things considered, it was a good class and I made several new friends who speak the same barefoot language that I speak. And I had the privilege to see Michael again the next day when he stopped by the Soft Star workshop to say hi to old friends and give a similar, but shorter presentation to our staff (he had difficulty finding a bad "hammer" shoe among our crew to make fun of). I was thrilled to be able to hang out with him for most of the afternoon, sharing stories and sharing laughs. You can also see Michael and Jessica's latest updates, including their tour schedule, on their Runbare website. And check out the website for Minimalist Mondays for more details about these free workshops.